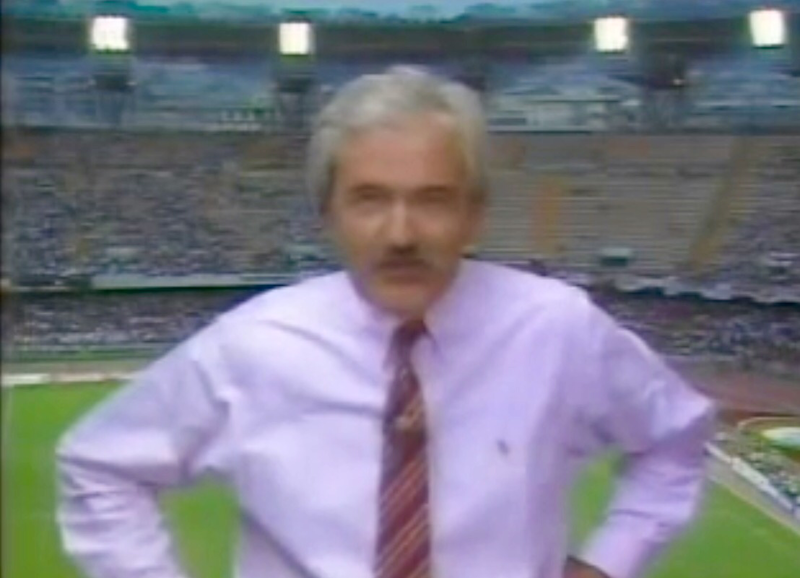 As we recalled in the first part of our look back at how Italia ’90 was televised, Des Lynam was on top form during Italia ’90 in the London studio. But for the quarter-final weekend he was off to Italy to host coverage from the stadiums of the hosts playing the Republic of Ireland on the Saturday and then England taking on Cameroon the following night. In his subsequent autobiography, Lynam questioned the merits of this – particularly as ITV were not enjoying great success with this format. There would be no on-site studio, Lynam being exposed to all he noise around him. He presented the Irish match smoothly enough in Rome and now made his way to Naples. Des started in characteristically charming mood. “I know you’re getting the hang of the tune,” he said in reference to Nessun Dorma. But then it went horribly wrong, as a sentence about England’s ambitions began to make no sense and neither did his attempt to correct it. “I’m so sorry I’m totally forgetting what I’m saying,” he told viewers, before managing to pull the word “endeavouring” out of he bag, folding his arms and reverting back to his old self. To most viewers, it wasn’t a big deal. it was two or three seconds out of a broadcast that would last about four hours and he had recovered extremely quickly. But for consummate professional Lynam it was a nightmare. Anyone who has made a bad mistake at work and then had to struggle on for the rest of the day can probably emphasise with how he felt that night, as he found the match going on around him without caring about wat happened. He feared for his broadcasting future after this clanger and was trying to work out just why he had been lost for words. But if Lynam rather melodramatically believed everyone was talking about his clanger, they weren’t. Today social media would probably immediately be awash with people sharing how they had picked up on him cocking it up, but in 1990 there was nothing to compare with that. The match proved dramatic and that would be easily the main talking point for millions, while the main headlines about the coverage of the match focused on ITV pundit Ron Atkinson. Not for the last time, Big Ron found himself at the centre of allegedly making racist comments while the microphone was still on. As with the previous round against Belgium, ITV went up against the BBC as England met Cameroon. They went on air half an hour earlier and had 1966 World Cup winning captain Bobby Moore in the stadium with Elton Welsby as they sought to lure viewers. But sadly their broadcast would be mostly remembered purely for the contribution of Atkinson, who unwisely declared on air that hard-tackling Cameroon defender Massing did not have a brain. Although Brian Moore – who made reference to the incident in his autobiography – attempted to defuse the comment by making clear he meant a “football brain”, Atkinson brought the issue back up at half-time and made a comment which could certainly be interpreted as racist. They thought they were off-air as they chatted, but other nations taking ITV’s live feed heard the words as complaints started to mount from overseas. It would be an unfortunate pre-cursor to the circumstances in which Atkinson would leave ITV in 2004. ITV editor Rick Waumsley said after the Cameroon match: “We absolutely deplore any kind of racist remarks and our commentators are given very strong reprimands when they say these things.” But Atkinson kept his co-commentary seat for the remainder of the competition and for the next 14 years was a mainstay of ITV’s coverage. One of the most distinctive elements of Italia ’90 TV coverage wherever you went was the graphics and on-screen captions used, These look a bit dated now yet seemed quite advanced at the time, but were not without some quirks. Cameroon’s Roger Milla repeatedly appeared as ‘Miller’, while England’s ‘trainer’ was known by his birth name of ‘Robert Robson’. And calculating player ages seemed also to be too much for the system used, Gary Lineker constantly shown to be 30 despite not reaching that age until November. But minor quibbles really, I still feel quite nostalgic when I see such captions appear. This was a good World Cup for the BBC commentator Barry Davies. He may have once more missed out on the final to perennial rival John Motson, but he got to cover three live England matches and the semi-final between Italy and Argentina. While commentating on Argentina beating Brazil, he had made his mark on the tournament by prolonging the word “Caniggia” for as long as possible as the striker rounded Taffarel to score the late winner. Now he was in the commentary box for England’s World Cup quarter-final, but – after being commentator on the loss to Argentina four years earlier – he looked to be describing a second successive exit at this stage as Cameroon deservedly came from behind to lead 2-1 in the second half (this time holding out on “Ekeke” as the player elegantly dinked the ball over Shilton to put Cameroon ahead). But with time ticking away came the bit of luck England had been praying for, as they were awarded their first penalty since February 1986. “Never a more vital penalty for England,” whispered Davies, conveying the true tension of the moment. Lineker scored and now the commentator was almost screaming “it’s all square”. 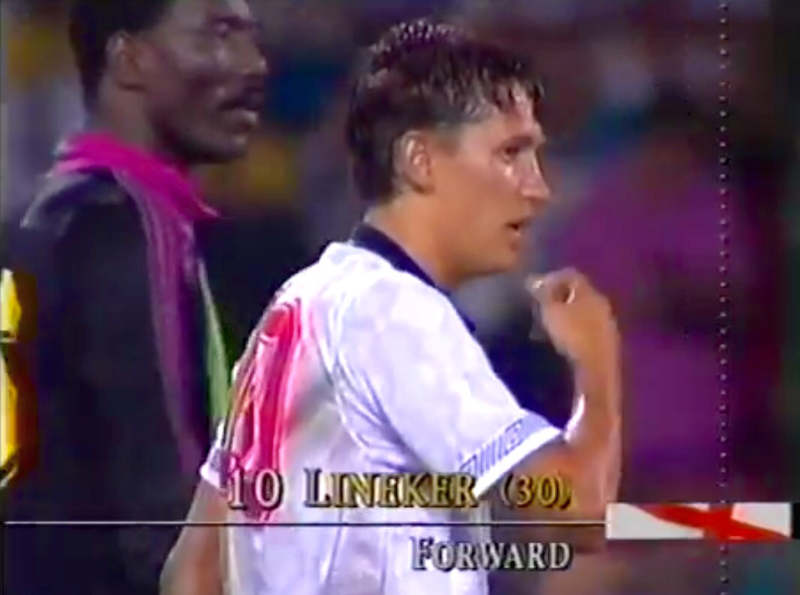 A further Lineker penalty in extra-time proved decisive, on an unforgettable night. “Determination and the riding of luck has taken England through,” proclaimed Davies at the end of the match, which was a fair summary. There was no question England had enjoyed some good fortune, but they had also shown character to claw their way back into the contest when all looked lost. A gleeful and relieved Bobby Robson said in one TV interview: “I’ve had 17 heart attacks, I feel 92…” I think we all did. Bob Wilson in the London studio for the BBC signed off by saying “we’ve all aged 10 years” before handing over to Lynam in the stadium. “You think you’ve aged 10 years?” asked Lynam, possibly deep down conveying how painful the night was for him. “What a traumatic night it’s been,” he said, which didn’t quite seem the right words to use to describe England reaching their first World Cup semi-final since 1966. For Des the night had indeed been traumatic. But less than 48 hours later he was back in the London studio as the semi-finals began between Argentina and Italy. The night after that he would again be in the hotseat for the biggest England match in 24 years – THAT game against West Germany.